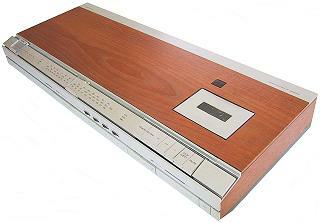 A replacement for the Beocenter 1500 and 1600 in one model, made by combining the Beomaster 1500 and the cassette section of the Beocenter 3600. In this version, the “memory” function of the tape counter, an addition over the previous Beocenter 3600 version (which stopped the tape during rewind once the “000” position was passed), was operated by a key matching the other tape transport keys. The improved specification of the cassette section of this model over those it replaced and the more powerful DC coupled amplifier were really worthwhile improvements, though the whole set was bulkier and had lost some of the slim elegance of the original. Beogram 1500 could be added if a record player was needed, though if this was the case Beocenter 4600 offered the same thing built in. Text copyright © Beocentral. Unauthorised reproduction prohibited.